Laney Directional Drilling recently completed a world-record Direct Pipe project in Cameron County, Texas. “The Gulf of Mexico Direct Pipe Shore Approach Project marked the first successful Direct Pipe shore approach in North America, as well as setting the new world record for length for Direct Pipe,” said Maureen Carlin, MBA, Ph.D., Laney strategic marketing manager. The distance of the direct pipe installation was 4,900 feet, with an additional 1,350 feet pushed out to the offshore contractor, for a total thrusted pipe length of 6,250 feet. The offshore pipeline was then attached to a direct lay pipeline along the bottom of the Gulf of Mexico to its termination onshore in Mexico. The direct pipe method is a product of Herrenknecht AG. The installation surpassed Laney’s previous North American Direct Pipe record of 3,505 feet, also in Cameron County, Texas, and the world record in Lochem, The Netherlands, at a length of 4,590 feet. Project owner is Valley Crossing Pipeline LLC, a subsidiary of Enbridge Inc. Laney was the drilling contractor and Strike LLC was the pipeline contractor. Valley Crossing Pipeline will transport gas to a state-owned facility in Mexico, which ultimately will serve 37 million customers, and other delivery points in South Texas. However, rough seas delayed the start of construction on the American side of the project in May and early June. According to Carlin, the 168-mile pipeline to Mexico was supposed to be in service in October. Valley Crossing Pipeline officials are now requesting an in-service date of April 23, 2019. The project initially was designed to be executed using HDD. DP also significantly reduced the volume of drilling fluid to be contained offshore compared to HDD. All pipe could be welded onshore for the pipeline for the underground segment, as well as the additional footage thrust offshore, to allow a lay barge to access in deeper water to begin the offshore lay. Project planning was also critical, particularly with regards to equipment. Laney worked extensively with Herrenknecht AG to implement an execution plan with the correct equipment design. Laney utilized its custom-built Herrenknecht HK750PT thruster and clamp with a Herrenknecht AVN 1000 TBM. Project equipment and crews were staged on an island off the mainland in the Gulf of Mexico located in Cameron County, Texas. From its launch pit, soil was excavated using a slurry-supported Herrenknecht Microtunneling Machine (AVN). This machine pumps excavated material through a slurry circuit inside the prefabricated pipeline to a separation plant located aboveground. The pipeline, laid out on the surface on rollers and welded to the end of the microtunneling boring machine (MTBM), was pushed into the borehole at the same time as excavation took place. Necessary thrust force is provided by the pipe thruster, which pushes the microtunneling machine forward together with the pipeline, with a thrust force of up to 750 tons, in increments of 5 meters. The push force is transferred to the pipeline through the pipe thruster’s clamping unit and then to the machine’s cutter head. During excavation, the tunnel face can be controlled consistently and safely using slurry-supported tunneling technology even in heterogeneous, water permeable soils. Uphill and downhill slopes, as well as curved drives along the alignment, can be managed precisely by the guidance systems. Laney used the Universal Navigation System Integral Module for the steering and guidance of the tunneling operation, as well as the Gyro Navigation System (GNS). Outfitted with a GNS, the machine did not have any components installed inside the pipe and line-of-sight was not necessary between the components. The north-seeking gyro compass was permanently mounted inside of the MTBM and was used to calculate the direction of true north as a reference to the MTBM axis. The current position of the MTBM was also calculated via coupled navigation. Finally, the Hydrostatic Water Leveling (HWL) was used to obtain the elevation data. The umbilical system was modified to the longer length, along with the internal confined entry set-up. Mobilization and setup began in mid-September 2017 and included foundation and thruster construction and Direct Pipe equipment. Set up took 34 shifts which were completed on Nov. 2. MTMB assembly and prep, launch seal installation and umbilical installation were installed on Oct. 6. Tunneling operations started on Nov. 9 and were completed 36 shifts later, with punch out on Dec. 2. An additional seven shifts were used to thrust out the remaining pipe string to the barge, which was completed on Dec. 14. Umbilical removal and equipment de-mobilization took 16 shifts with all project operations completed on Jan. 13, 2018. Built with Derrick components, the system is comprised of multiple separation stages designed to keep up with high solids loading from Direct Pipe tunneling operations. Secondary separation is performed by two Derrick High “G” Linear Motion Shakers outfitted with Derrick’s innovative Pyramid Screen technology to remove as many solids as possible prior to hydrocyclone processing. This maximizes the hydrocyclones performance and allows them to work on the finer sands and silts limiting particle attrition, wear on centrifugal pumps, and other downstream processing equipment. One set each desanding and desilting hydrocyclones are mounted above two more Derrick High “G” shakers outfitted with finer Pyramid screen technology to complete the main cleaning system. Additional fine solids removal is performed by centrifuge technology as the final step in the cleaning process. With any installation that pushes the limits of what has previously been accomplished, there are numerous challenges throughout design, project planning and construction. In total, Laney performed nine confined entries with the furthest entry at a length of nearly 4,000 feet into the pipeline. All entries were made safely with no negative results or safety breakdowns. 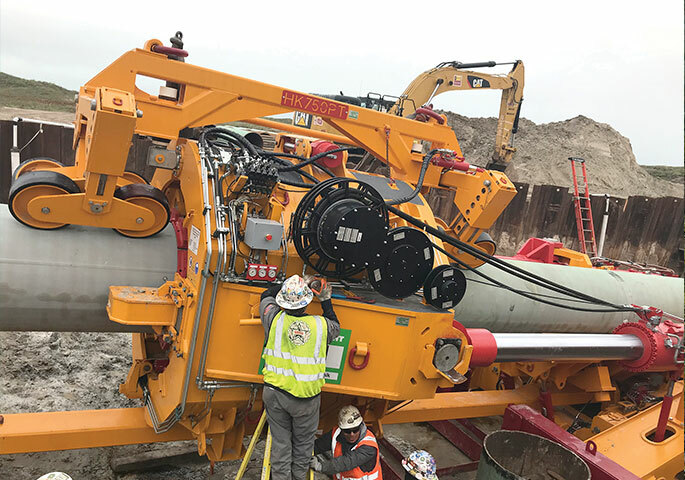 In addition, the Gulf of Mexico Direct Pipe Shore Approach marked the 11th successful Direct Pipe installation for Laney, giving the company the record for total pipeline installed in North America − at more than 23,000 feet.